While the Australian healthcare system is recognized among the best in the Organization for Economic Cooperation and Development (OECD), the system struggles with its framework, which relies primarily on public reporting of health services and patient-reported outcomes. Australia’s healthcare depends more on word-of-mouth than physical data collection. But when 1 in 3 (88.4 million) prescriptions are written for cardiovascular diseases, medication compliance monitoring can’t be left to risk. When an individual suffers from a chronic illness such as cardiovascular disease, prescriptions and doctor visits are often central to their treatment. In the current system, caregivers ask the out-patient to track their medication consumption and report their compliance back during regular office visits. Doctors are dependent upon their patients to receive accurate compliance information. But if a patient intentionally or unintentionally misses a dose of medication, then both the patient and doctor suffer the consequences of this oversight. The LIVIT virtual care ecosystem was built to handle this discrepancy of data. Rather than rely on word-of-mouth collection, LIVIT provides a platform for patients and caregivers to monitor compliance together with the aid of analytic software and hardware. With LIVIT, a patient with a chronic disease can easily track when they take their medication through the Bluetooth connection of the device on their pill bottle and the mobile app interface. Every time a pill is taken, the mobile app records the information to show the total number of pills taken and the number of pills remaining in the bottle. Smart alerts remind the patient when it’s time to take their pill, if a dose was missed, or if too many pills were consumed. These smart alerts also inform caregivers if their patients are compliant and to what degree. By using LIVIT technology, data becomes more reliable, more accessible, and potential office visits may be reduced. Rather than always pay a copay, patients will have the option to reach out to their caregivers through text messaging and video calls to get answers to their health questions and concerns. 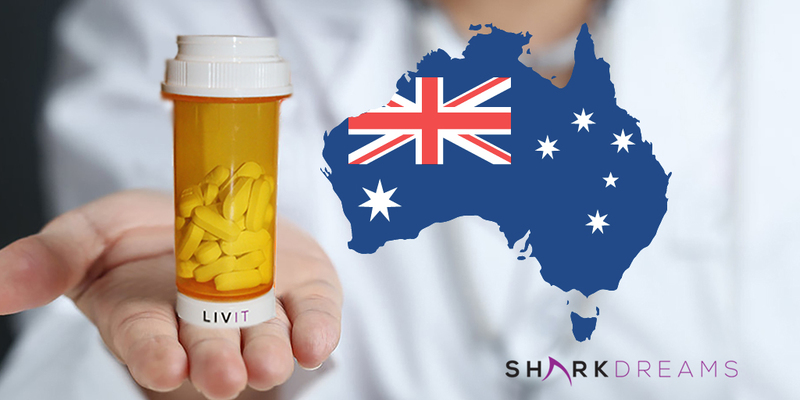 As LIVIT makes its global launch, locations such as Australia can anticipate seeing an increase in patient compliance and a decrease in unnecessary spending on medication nonadherence. On average, Australia’s population of 28.4 million is seeking more primary health services than they were 10 years prior; in 2014 and 2015, statistics show 85% of Australians had seen a primary care physician within the past year. The current healthcare system, a hybrid model, is one in which private insurance coverage can be purchased in addition to one’s public insurance, gaining access to private and public hospitals alike; this applies to not only permanent residents and citizens, but refugees, as well. Of Australia’s permanent residents, 100% have public health insurance—with 85% of specialists’ costs covered—and 50% of residents have additional private insurance. The government itself funds 67% ($115 billion) of all healthcare spending, and 33% ($56 billion) is funded by non-government sources—17% ($29 billion) of which is contributed by individuals. Cost is a major factor when people are considering whether or not to seek medical attention. With 1,300 hospitals available (700 public; 600 private), and 406,000 visits to primary care physicians occurring each day, individuals are spending upwards of $7,100 on healthcare every year. In 2016 and 2017, 4.1% (663 thousand) of people over the age of 15 declined or delayed seeing a primary care physician at least once when necessary; another 7.3% (974 million) of people avoided or delayed filling a prescribed medication due to cost. When a platform such as LIVIT is integrated into a healthcare system, the amount of money lost to system inefficiencies is reduced, so patients can receive the medical assistance they need regardless of the price tag. In total, $20.8 billion was spent on prescription and over-the-counter medications from 2015 to 2016. And while the Australian Government covered the cost of 87% of prescriptions through insurance, a number of medications, such as private prescriptions and over-the-counter drugs, didn’t include a government subsidy. Approximately $10 billion, paid by consumers, went towards covering these expenses; an additional $3 billion was spent by hospitals for medications not covered by government funding. For individuals suffering from chronic diseases, the burden of cost weighs even heavier. Recent studies report that 78% of people living with advanced chronic obstructive pulmonary disease experience monetary hardships from managing their condition; 27% were even unable to pay their medical and dental expenses. Individuals facing chronic conditions such as cancer, stroke, kidney disease, and end of life care all face a similar challenge. For every chronic disease diagnosis, an individual faces a 46% increased likelihood of severe financial difficulties due to health expenses. By folding the LIVIT ecosystem into their healthcare framework, Australia would not only be reducing unnecessary government and private expenditures, but it is also improving individuals’ ways of life. For those diagnosed with chronic diseases, the positive impact made by LIVIT would be even greater. Recent statistics show that many Australians already use digital technology to monitor their personal health—therefore LIVIT technology could be seamlessly integrated into their day-to-day health tracking. 86% of households have internet access, and 88% of people aged 18-75 have access to a smartphone. With 78% of adults using the internet to find health-related information, and 96% of general practitioners using computers in their clinical duties, Australian’s are already moving towards a technologically aided medical future. While the Australian healthcare system is recognized among the best in the OECD, the inclusion of LIVIT would improve its efficiency, decrease its annual spending, and improve the quality of life of Australia’s inhabitants—whether government or privately insured. Essue, B., Usherwood, T., Laba, T., Leeder, S., Yusuf, F., Gillespie, J., Perkovic, V., Wilson, A. & Stephen Jan. (2014). Out-of-pocket costs of health care in Australia: Submission to the Standing Committee on Community.